Americans like cars. Just how much they do is easier to see with two sets of comparative data (first image, second image). The United States is toward the top of the list with a number of notable smaller countries. Other large countries tend to be further down the list (except for Italy). Having higher levels of wealth seems to be at least slightly connected to higher rates of car ownership. However, this is not necessarily a strong relationship. 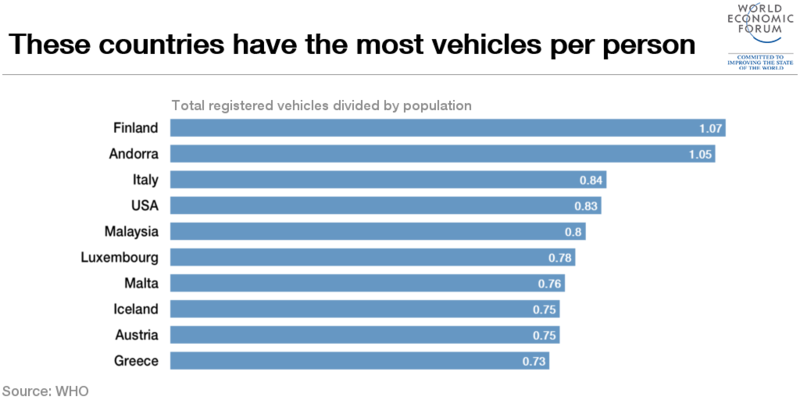 In other words, different wealthy countries have different approaches to vehicles. Compared to the United States, the other G7 members are far down the list. This entry was posted in Sociology, Transportation and tagged cars, driving, wealthy. Bookmark the permalink.